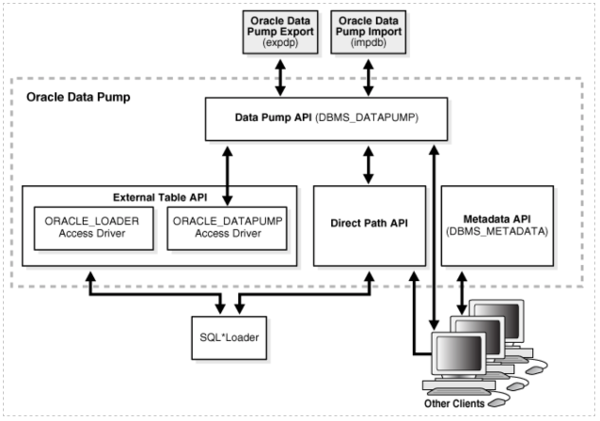 Oracle® Data Pump (expdp, impdp) is a utility for exporting and importing database objects in and across databases. While most database administrators are aware of Data Pump, support for multitenant architecture in Oracle Database 12c introduced changes to how Data Pump exports and imports data. This two-part blog series covers the changes to Oracle Data Pump Export (expdp) technology and how to use it to take exports of components of your database architecture. The examples in this post focus on exports in the context of a container database (CDB), which holds the Oracle metadata, and one or more pluggable databases (PDBs), which hold your actual data. For more information on PDBs and CDBs, see Introduction to the Multitenant Architecture. A full database export doesn't necessarily include all of the data that you might want. For example, you might think that when you connect to the root container or CDB and take a full export of the database, the export includes all of the PDBs that belong to it. However, that’s not the case. The full export from the root container only exports the objects that belong to the root container, and not the PDBs. When you try to take a full export, EXPDP only takes an export of the objects that belong to the root container, and not the objects from all of the pluggable databases. WARNING: Oracle Data Pump operations are not typically needed when connected to the root or seed of a container database. Below are the steps for exporting of full database. The output shows that only the objects that belong to the root container are exported with the full option. Unfortunately, there's no way to take an export of all of the PDBs and the root container together. Taking an export of the CDB or root database isn't typically required because it primarily hosts PDBs. However, if it becomes necessary to perform this task, you can create a new CDB and plug the existing PDBs. In these cases, administrators are usually most interested in taking an export of the common users and roles. Copyright (c) 1982, 2013, Oracle and/or its affiliates. All rights reserved. Ideally, you wouldn't need to take an export of the root container objects unless you had data that belongs to the common users in that container. Following the steps outlined in this blog post will help you use Data Pump 12c's new features to export data more easily. Part 2 covers Data Pump's restrictions on PDBs and how to export these databases.